Schizophrenia is one of the most misunderstood mental health conditions, and as such, it is often stigmatized more than other mental illnesses. There are a variety of causes for this. It’s a disease that’s not well understood, even by the medical and mental health community. It’s not completely clear how the illness manifests itself, and it’s difficult to diagnose until it’s fully developed. Once this occurs, it’s not easy to treat, and those who have schizophrenia can exhibit a wide range of symptoms. For these reasons, it can be difficult for people suffering from schizophrenia to get the help they need. Here, we’ll talk about all of the issues surrounding schizophrenia, including causes, schizophrenia symptoms, and ways of accessing quality treatment. According to the National Alliance on Mental Illness (NAMI), schizophrenia is a chronic and severe mental illness that impacts a person’s ability to control their behavior and communicate with those around them. Categorized as a type of psychosis, schizophrenia is marked by erratic behavior, delusions, and intense paranoid behavior. People with the disease can be a danger to themselves and others, especially if the condition goes untreated. Here is an extensive overview of what schizophrenia is, how it’s diagnosed, and key factors in the treatment of the disease. The symptoms of schizophrenia reveal why the disorder is considered to be one of the most severe mental health conditions. Schizophrenia manifests itself through different sets of symptoms in patients, which is part of what makes it difficult to diagnose. There’s no single behavior that provides bystanders a clue that a person might be developing the illness. Hallucinations and delusions: Schizophrenic patients might have an alternate perception of reality and exhibit extreme paranoia. They might also hear, see or smell things that aren’t there. This can cause them to behave erratically and hurt themselves or those around them. Negative symptoms: This is an umbrella term for behavior that describes a decrease in a person’s physical and mental abilities. This group of symptoms is common among schizophrenic patients, who can have difficulty communicating or performing basic daily tasks. Cognitive impairment: When individuals develop schizophrenia, they tend to exhibit worsened memory and cognitive function. According to NAMI, this leads to a symptom called anosognosia. This causes many schizophrenic people to lack the awareness needed to realize that their condition has changed. These symptoms are fairly broad, part of the reason why schizophrenia is notoriously difficult to diagnose. Cognitive impairment and negative symptoms can be misdiagnosed as simpler, more common conditions like anxiety, depression or a variety of other disorders. Schizophrenia is one of the rarer mental health disorders in existence, which is part of the reason why the treatment community is continually making new discoveries about it. According to the World Health Organization, 23 million adults worldwide suffer from the disease. In the US, schizophrenia has only a 1.2 percent rate of prevalence, with about 3.2 million adults experiencing it. For the sake of comparison, schizophrenia prevalence in the United States is less than that of many other mental health conditions, including general anxiety disorder, social anxiety disorder, post-traumatic stress disorder, and depression. Schizophrenia often develops when a patient is in their mid to late 20s. This is a time when change is common in a person’s lifestyle and habits, making it more difficult to notice when a person’s behavior starts to alter because of mental illness and not development or evolving external factors. According to NAMI, it’s most common for diagnoses to occur when people are between age 12 and 40. Warning signs of schizophrenia can present themselves during a person’s teen years. In schizophrenics, the years before the diagnosis of the disease are labeled the prodromal years — a term used to describe the period between the appearance of the initial symptoms and the full onset of a disease. In teens, prodromal schizophrenia causes social withdrawal, a change in grades and behavior and other symptoms. 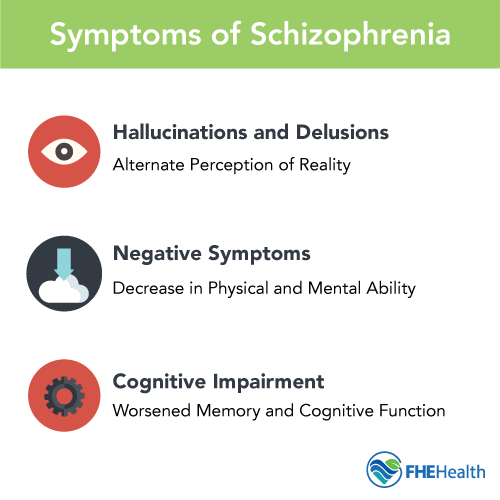 The problem with early diagnosis is that these so-called schizophrenia symptoms can be conflated with or even confused with common teenage behaviors. With this in mind, if a person exhibits these behaviors in conjunction with a family history of psychosis, additional evaluation may be needed to catch the signs of schizophrenia before it gets too advanced. Genetics and brain chemistry: It’s believed that many mental illnesses can be brought on by pre-existing factors within a person’s brain makeup. Some mental health disorders are linked to congenital factors. Environmental exposure: Schizophrenia may also be caused by dormant defects experienced at or around the time of birth related to chemical exposure or other environmental factors. It’s been suggested that the use of psychoactive and hallucinogenic drugs (LSD, for example) may raise the risk level a person has for developing schizophrenia in the future. In addition, people suffering from conditions like schizophrenia are naturally more likely to be dually diagnosed with other conditions such as addiction. This can cause the underlying issue to be more severe and harder to treat successfully. Schizophrenia is diagnosed using a psychiatric evaluation and cross-referencing the disease’s criteria via the Diagnostic and Statistical Manual of Mental Disorders (DSM-5), published by the American Psychiatric Association (APA). According to the Mayo Clinic, there are several methods that have been proven to be effective in treating schizophrenia in those diagnosed with the disease. Medication: People experiencing schizophrenia symptoms are commonly prescribed anti-psychotics aimed at suppressing the symptoms that cause erratic and potentially dangerous behavior. An issue with the success of medication-assisted treatment for schizophrenia is that compliance with the treatment is difficult given patients’ paranoia and erratic behavior. Inpatient treatment: Admittance into a rehab center can help people with schizophrenia and other mental health conditions develop the skills and behaviors to live a normal, healthy life. Inpatient mental health treatment focuses on stabilizing the body with medication and providing education and counseling so patients are given the best chance to live free of the damaging effects of their disease. Schizophrenia is not curable, but with the right management, you can live your best life. Contact FHE Health to learn more about how we handle cases like those mentioned in our dedicated mental health treatment facility.